The Home of Mr. Ernest F. Guilbert » James Betelle, Where Are You? 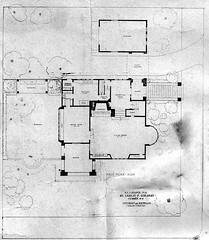 In my entry regarding the Franklin Murphy house, I ruminated that it was the only known residential structure designed by Guilbert & Betelle. As it turns out, I was wrong. I’ve recently had the privilege of corresponding with members of the Guilbert family, who have shown a keen interest in my research. Given the circumstances of Ernest’s early death, they didn’t really know much about him, so I was happy to share what little I had discovered. Fortunately, discovery is a two-way street: the Guilberts had a number of items dating back to Ernest’s day, and were gracious enough to send them to me for study. The collection contained photographs of the Guilbert family having a fun day at the beach (complete with head-to-toe bathing suits) and a handful of formal portraits. Most interestingly were a number of large, high quality photographs of his house and section of a rare House & Garden magazine from September, 1911. I already new Guilbert lived in a noted Dutch Colonial home in Forest Hills (the same tony Newark neighborhood where the Murphy house would be built years later). I also knew that it was only a few doors down from a school of his design, the Ridge Street School. What I didn’t know is that Guilbert himself designed it. I’ve handled some fragile items in the course of my research, but the H&G was among the most damaged—yellowing tape did its best to hold the delicate pages of the magazine together, but bits flaked off with barely a touch. I examined this with great care. The article is a profile of the home and its architect designer, describing in ample detail the structure, philosophy and appointments of the rooms. Photographs, even in deteriorated state, show an eclectic mix of opulent and formal Victorian, Tudor and clean classical styles. What is most revealing is that on the plans, the architects of record are “Guilbert & Betelle”. This is significant, because in 1911 their firm was but a year old, and current works in progress for the Newark school system were all credited solely to Guilbert. Therefore, this is the earliest structure I know of officially attributed to Guilbert and Betelle, Architects. It’s unknown to what degree Betelle was actually involved with the home’s design. He was certainly knowledgeable of the Dutch Colonial style; he wrote a forward to a book on the subject. Details such as this double-height window being similar to one he employed 16 years later at New Rochelle High School suggest it held influence on him as well. 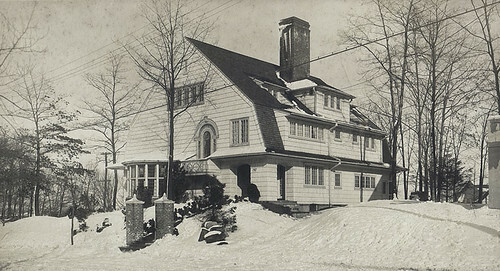 The Guilberts only enjoyed the home for about five years; it was sold following Ernest’s death in 1916. It’s fate in the year since are a mystery, as the house no longer exists. Where it once stood is now an empty lot. Why the home was razed I can’t guess—Fire? Neglect? Whatever the reason, at least these photographs exist to preserve it as intended by its architect. UPDATE: I went to Newark this week to visit the site of the house, to try and answer a few of these questions. I had been there a year ago to visit the Ridge School, but at the time I didn’t know much about Guilbert, so didn’t pay much attention to the lot. I did remember there were a number of houses next to the school, but those are all now gone. 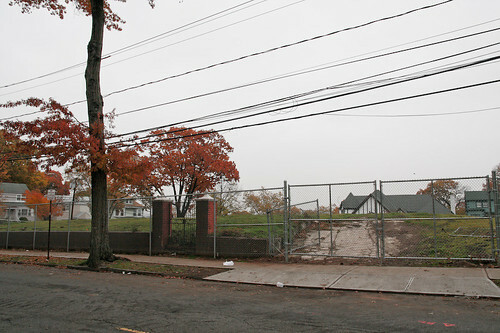 The entire end of the block, leading up to the Ridge Street School is an empty field of grass surrounded by fence. Clearly someone had been busy snatching up the lots to make a single big one. Amazingly, Guilbert’s original brick entry posts still stand. They’re painted red, but the decorative caps (topped by welcoming stone pineapples), appear untouched. Fragments of the original brick steps remain. 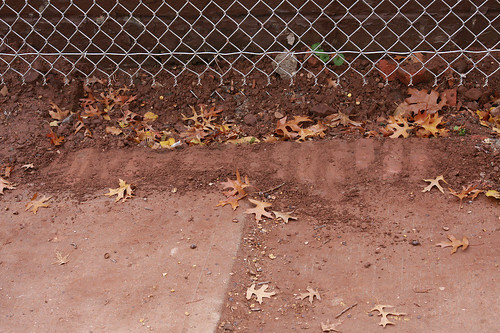 Some of the brick that lined the sidewalk remain as well. I eventually learned the city of Newark has spend the last 15 years or so slowly taking over the lots for a planned addition to the Ridge School. Fortunately, being an historic district, the original building will not be torn down. It seems most likely to me that the city simply tore down the home to make room for the new school. There is some degree of poetic symmetry that the land once owned by the builder of the school is now being used for the school itself. I have so loved reading your blog! Clearly you like going down the rabbit hole of curiosity as much as I do! I found your blog while researching the Yama Farms Inn in Ulster County, New York, and came across a now-digitized version of the September 1911 House & Garden that Ernest F. Guilbert’s family showed you (it also had a story on Yama-no-Uchi aka The Yama Farms Inn). I saw the feature on Guilbert’s home and decided to look it up to see what it looked like today (sad to find that it’s gone). The cover of the H&G was not digitized, but I saw that it’s also now available from Getty Images (but must be purchased), or can just be viewed.